This is a classic early spring run, superior to many better-documented runs. It had not been listed in a guidebook since Charles Martin's Sierra Whitewater in 1974, until Holbek added the Martin run to his 3rd edition. The put-in recommended here avoids the long portage required by the Martin run. This stretch provides a mix of relatively benign class III-IV rapids, with no portages, plus some intriguing low-elevation granite scenery. Its only defect is frequent (but passable) willow gardens. 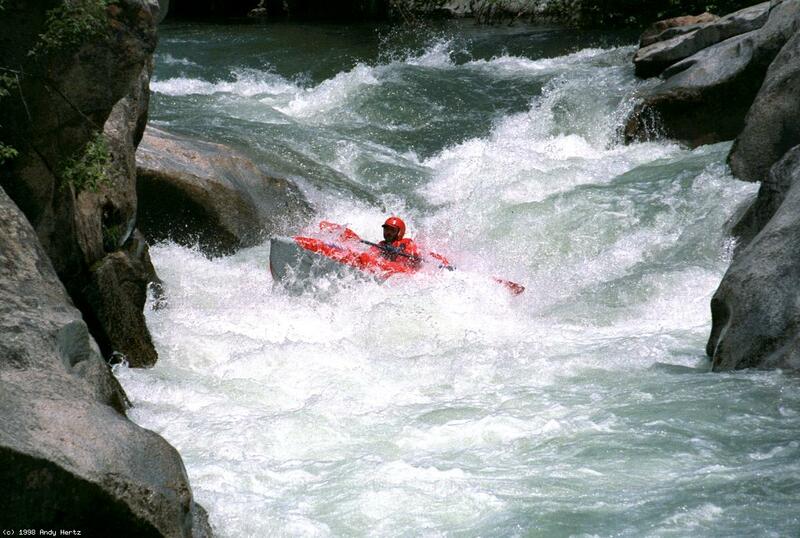 Because of this, and a narrow streambed, this run can be hazardous at high flows. The flow equals about 40% of Michigan Bar (MHB) during snowmelt, and less than 40% after recent rain. Recommended flows are 300-500 cfs for inflatable kayaks, and 450-900 cfs for small rafts or hardshell kayaks. 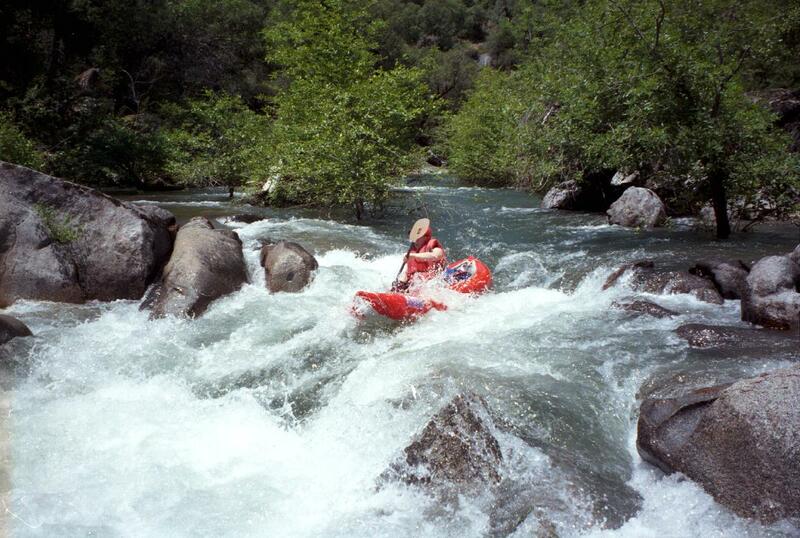 I know of one high-water trip that ended with a lost boat and broken ankle. If you hike down from the end of Starburst Road to put-in, note that there are two creek crossings near the end where you will get your feet wet. It is possible to avoid these crossings by veering left, going slightly uphill on a newly established road. The Cosumnes river is quiet in that stretch; do not be fooled into thinking it is not there. 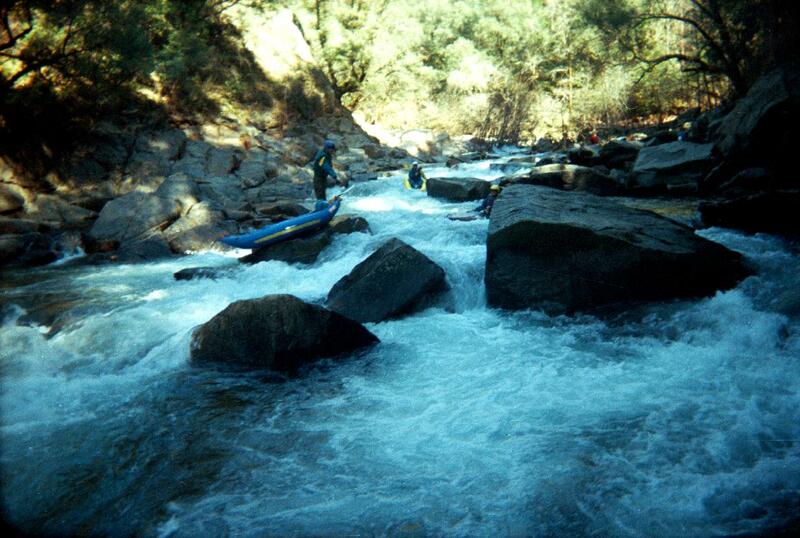 Easy rapids over gravel bars and thru willow-lined channels (good warm-up before the first big rapid). Recognition: bird house high in a pine tree (1997), and large granite outcropping on the left. After a left turn containing some brush, the river drops steeply thru a deeply cut slot in the granite bedrock. 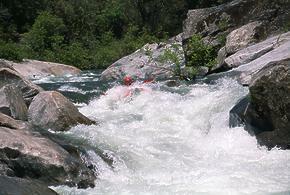 The main drop contains a left-to-right curling wave that is hard to miss. 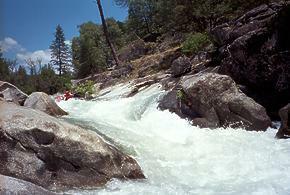 A natural amphitheater below constitutes a good recovery pool. Hazard! Ian Buckley reports that a serious sieve has developed on river left immediately below the main drop. Inspect it carefully and portage if necessary. (January 2005) Fortunately the worst sieve is above the main drop. The river exits to the right of the amphitheater, curves left, and plunges over a series of drops that automatically slalom your boat. 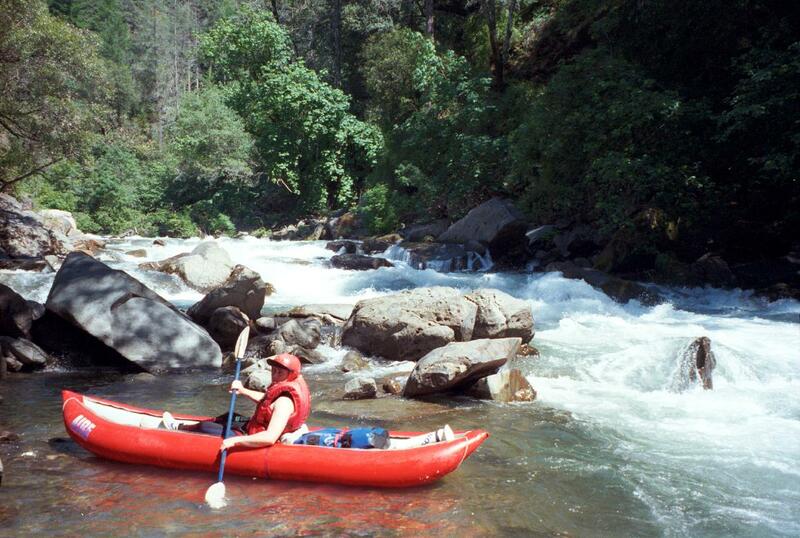 Granite bedrock funnels the river down towards a plug rock, or hole with more water; this rapid may require portaging at low flows. This rapid starts off with a series of shallow drops over flaking granite bedrock, and finishes by flushing into a large hole on the right, then into the left bank. The easiest line is on the left side. Potentially hazardous at high flows because of what follows downstream. Several steep bedrock rapids are at least class III; some folks might want to scout. The first one is less steep on the right. Willow-choked bar, formerly runnable on the left, and after the flood of 1997, also on the right; the left channel is deeper but ends in a rock lattice. Plymouth diversion dam; the safest run is on far right, where there is a fish ladder of sorts, but center works. After this come several bedrock class IIIs, a long bouldery class III, and a good lunch beach on the left. Spanish Creek enters on left. 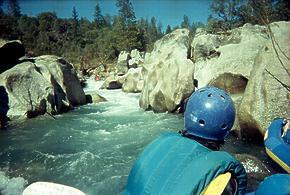 After a class III boulder bar rapid, the river enters a shady gorge with a scenic cliff on the left. Steep bouldery drop, runnable in the center or right side. The left wall near the bottom formerly contained a fairly serious undercut, but no longer does after the flood of 1997. After this come some bouldery class IIIs. The flood of 1997 created this by pushing rocks down to the left side of an island, where the gradient drops suddenly. 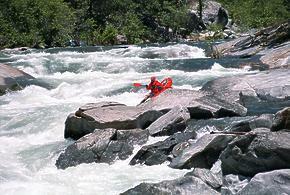 There are some major drops among big rocks, but this rapid is generally boat scoutable. Log choked in 2005. The entrance is guarded by hanging-down tree branches, making it difficult to see from the big eddy at a sudden right-hand turn. A small left-side eddy below is difficult to make at high flows. After that, steep constricted drops among substantial boulders. Hydraulics get pretty big as the gradient steepens shortly after the small left-side eddy. Long run-out makes a bruising swim. 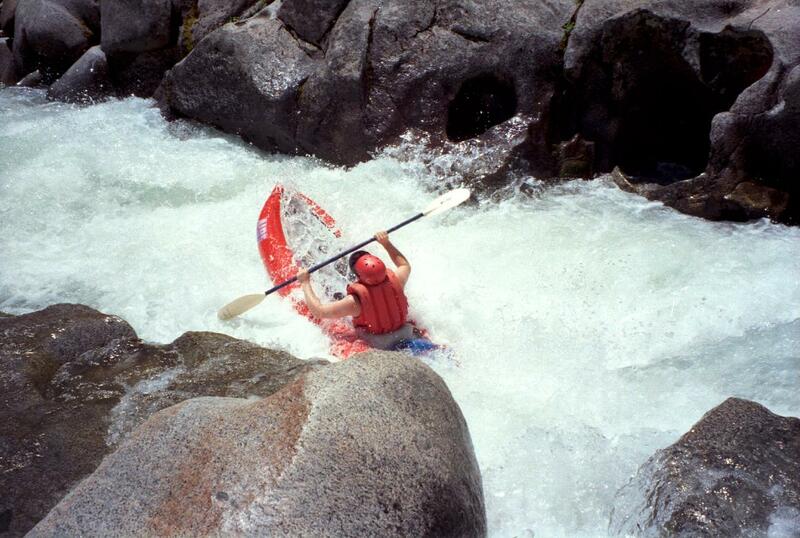 There is a good eddy on the right near the biggest boulders, but it is hard to catch. 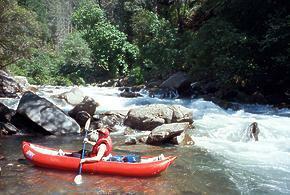 If you do, you can easily scout the second half and Small Rock Debris from the right bank. Boats in the entrance to Big Rock Debris Oops, we forgot to scout and get pictures! 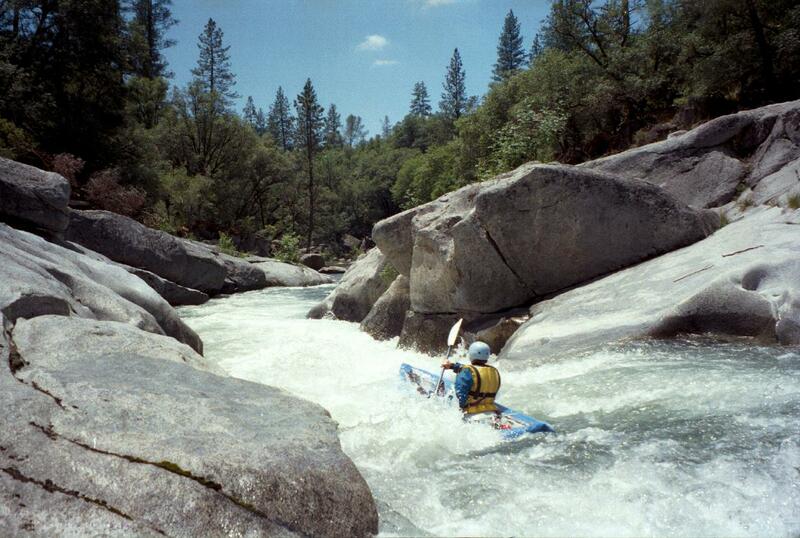 This was a class IV before the flood of 1997, but is now much easier. There is currently a route on far left, and a good channel starting on the right and moving left. Just below Small Rock Debris, the river splits around an island. This long rapid is often described as a continuous class III+ for over half a mile, adding up to solid class IV. The flood of 1997 created an easier channel to the left of the island, but future floods could return the river to a rockier channel on the right. At higher flows this section remains continuous, but less so at lower flows. Rather than ending suddenly, whitewater sections gradually mix with calm spots. An enjoyable mix of class IIIs and IIs. South Fork enters on left. 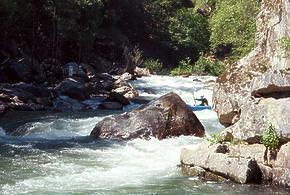 Rapids become IIs and a few IIIs. Around mile 8.5 is a class III with routes hidden behind large rocks. North Fork Cosumnes enters on right, almost doubling the flow. 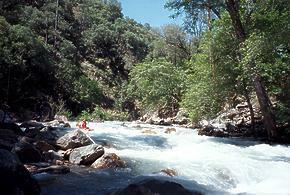 There is a commercial campground upstream on the north fork. Highway 49 bridge. Take out on right shortly below the bridge, and carry up a wide trail to the highway. Law enforcement makes it impossible to park north of the bridge to load boats, but you can carry across the bridge, or execute a commando gear load. There is an alternate take-out beach on the left bank, but the trail is laced with poison oak. To reach take-out, drive south from El Dorado on highway 49, or north from Plymouth, and park just south the Cosumnes river bridge. No parking signs were torn down recently and the CHP allows cars to park in the wide gravel turn-out (2005). To reach put-in, drive 2.7 miles north from the bridge and turn right onto Sand Ridge Road. Continue 8.9 miles (the road changes to dirt and back), then turn sharp right onto Morning Canyon Road. After .5 mile, turn right on Starburst (private road, be discreet) and drive downhill for .7 mile. Private drives are hard to distinguish from the road itself; stay on gravel. At one point Starburst climbs uphill. You come to a gate, probably closed. 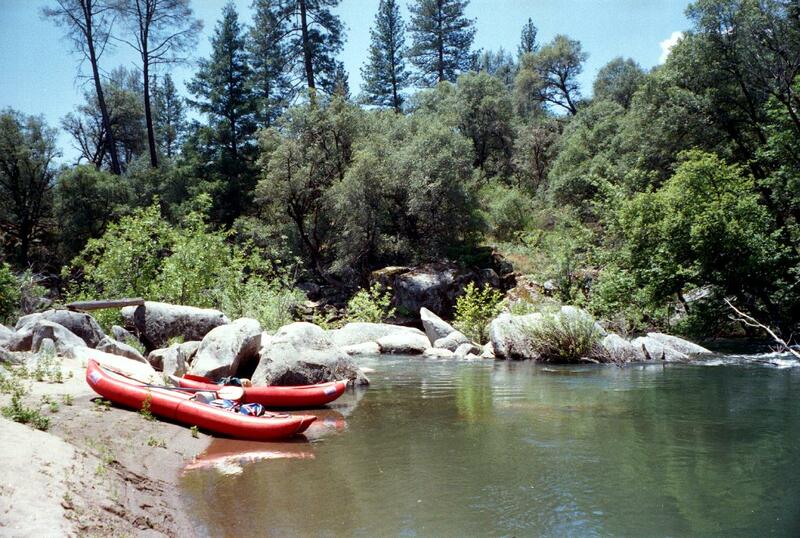 Unload boats at a wide spot near the gate, on BLM land. No Parking signs have appeared recently, so you will need a shutte driver, or you will have to park uphill and walk back down. In past years serious 4WD vehicles could continue down to the river, but now you must walk downhill .5 mile on this rough road. 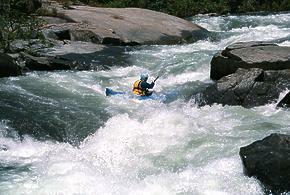 It is possible to put in at the traditional access upstream, above a long portage around a class VI rapid. The traditional put-in on Morning Canyon Road at the County Park is easy. 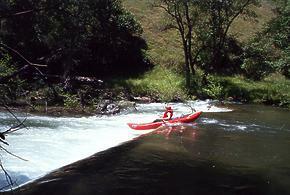 The park is across the river from Outingdale and about .5 mile upstream of the class VI rapid. The Charles Martin and Lars Holbek guidebooks imply that the portage is difficult, and may involve additional portages downstream, although the distance to Mocho Canyon and Starburst Road is not very far.